It's a brand new year which means Nike is loading up on some brand new versions of already established models. One of the Nike shoes to get this same treatment is the VaporMax. The VaporMax was debuted in 2017 and received the 2.0 version in 2018, so it only makes sense that we're getting the 3.0 now that we're in 2019. Probably the biggest difference between this year's version and last year's is the flyknit pattern. The flyknit pattern on the 3.0 features consecutive parallel lines which are reminiscent of the primeknit upper on the UltraBoost 4.0. With the VaporMax 3.0 making its way to retailers, the Beaverton brand has been revealing new colorways almost every single day. Many of the colorways have been pretty loud in terms of the color choices and this latest version is no different. While the upper is mostly grey and black, the sneaker is highlighted by some colorful accents. 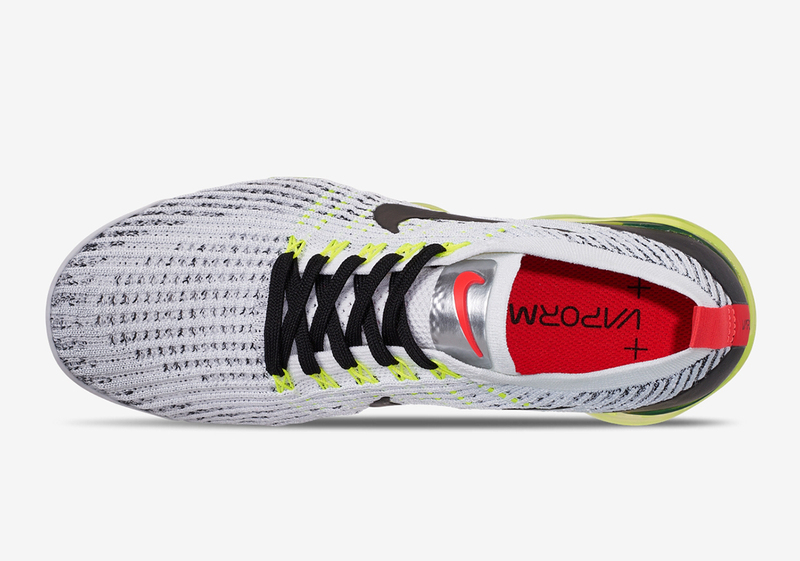 For instance, the air pods on the bottom are dressed in Volt, while Crimson is found on the heel tab and the Nike swoosh on the tongue. If you're looking to purchase these, they will be available on April 11th for $190 USD, according to Sneaker News.